Storage has never been this easy! All you have to do is schedule a time for delivery and tell us when and where. We’ll deliver as many storage vaults as you need and pick them up at a time that’s convenient for you. One of our knowledgeable drivers will give you a quick and simple orientation on how to load your storage vault and secure it when you’re done. We offer the convenience of delivering one more storage vault than you may need just in case, if you don’t use it that’s ok, you only pay for the storage vaults you use! Need help packing – you can hire our movers to assist you. When you have finished loading the storage vault, just call us and we’ll take them back to our secure, dry, totally enclosed, climate-controlled storage facility. We can store your inventory in our facility until you need them. You can arrange to have us accept deliveries for you. With a quick phone call, we are able to deliver only those items that you require. We control your inventory levels for you. The value of our warehouse operation shines when we combine it with our transportation capabilities. 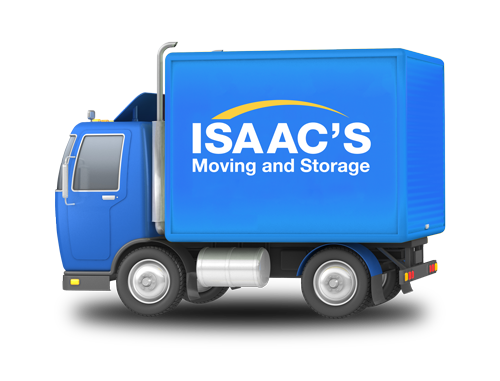 Isaac’s Moving and Storage can move your goods directly from our warehouse to any point in the continental United States completely hassle-free. We can monitor and report inventory, package and ship items, and provide full service distribution services for items stored in our facilities. Isaac’s Moving and Storage will allow you to stay in control, while we handle fulfillment of your orders with speed and accuracy. PLANNING A MOVE? NEED STORAGE?